im new in counterparty and im now testing around in testnet with counterparty assets. in general there are not many issues but still some and i did not find a solution yet. maybe someone can help. in coindaddy testnet wallet description looks like http://mydomain.com/data/name.json and not as my description given in .json. and there is no icon of my asset visible. same thing happens when i look asset information in testnet explorer, there is no description given only url of my .json, but i can see the icon of my asset. i tested it also in freewallet.io application and there is description available exactly like its given in .json (this time there is no link visible), but it does show only counterparty icon. What should i do for that, that it works properly, so that description is everywhere like i described my asset and icon of my asset? are there same kind of problems in mainnet? i hope someone can help me to solve this problem. sad, because so is really not usable for my stuff. You set your asset description to point to a specially formatted .JSON file, and put your description in there. If you set things up correctly and your JSON file is accessible, then the block explorer will be updated with your information. Also, if you want help in the future, please give more details on the issue… like the JSON url you were trying to use, the asset you were trying to update, etc. Like in grumpycat… explorer shows in description the .json url and not the description what is given in .json. description scould be in text foermat and not as url for .json. then it would be correct. in freewallet it shows description in text format and does not show a json url. why .json url should be visible to anybody anyway??? The block explorer shows the description associated with the asset, which in this case is a JSON url, so it is showing the correct thing. If an asset has a .JSON file description, then the block explorer parses in that information and displays it in the “Enhanced Asset Information” section (notice the highlighted text in the previous screenshot). 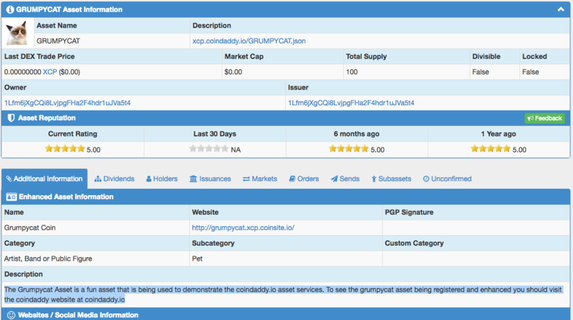 The block explorer is doing what it is supposed to… show you the ACTUAL info in the counterparty description (the JSON URL) and the showing the the ENHANCED information in the ‘Enhanced Asset Information’ section.